Let's start off with the Mega Defense Essence Oil. The main ingredients in the oil are emollients (Caprylic/Capric Triglyceride, Neopentyl Glycol Diheptanoate, Dimethicone, Octyldodecanol, Tricaprylin), and these are pretty nice choices - they're emollient, along with some of my favourite standbys (Caprylic/Capric Triglyceride being one of them), and some of them and some (like Dimethicone) are also chosen for their lightweight feel on skin. There's also a wetting agent (Trisiloxane), which is a watery silicone that helps to lower the surface tension of the oil and make it feel more water-like and less oily. It also spreads out the product on skin before evaporating, so in that way it also functions as a spreading agent or carrier for other ingredients. 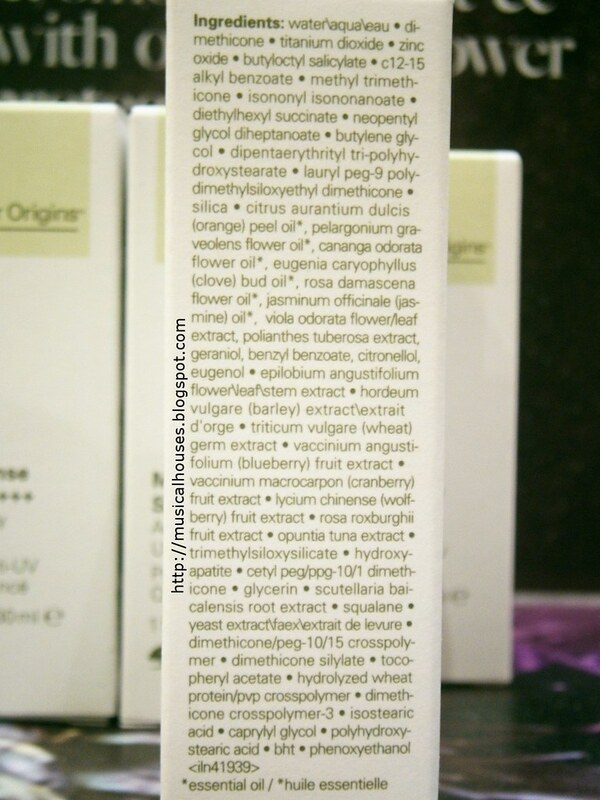 So from the first few ingredients, which make up the bulk of the product and give it its key properties, we can see that this is going to be a nice emollient oil, which has been specially formulated with aesthetic considerations in mind - the ingredients have been chosen to avoid an oil that's too goopy or heavy. Another bonus is that none of these ingredients are likely to cause breakouts and should be fine for most consumers, unless you happen to be in the minority that's sensitive to one of the above ingredients, like some of the silicones. The rest of the ingredients include a slew of plant oils and extracts (Camellia Oleifera Seed Oil, Oenothera Biennis (Evening Primrose) Oil, Salicornia Herbacea Extract, Olea Europaea (Olive) Fruit Oil, Citrus Aurantium Dulcis (Orange) Peel Oil, Pelargonium Graveolens Flower Oil, Cananga Ddorata Flower Oil, Eugenia Caryophyllus (Clove) Bud Oil, Rosa Damascena Flower Oil, Jasminum Officinale (Jasmine) Oil, Viola Odorata Flower/Leaf Extract, Polianthes Tuberosa Extract, Farnesol, Eugenol, Citronellol, Citral, Geraniol, Silybum Marianum Seed Oil, Vegetable Oil). Most of the plant oils (Evening Primrose Oil, Olive Fruit Oil, Camellia Oleifera Seed Oil) provide some emollient properties and could have some additional benefits like anti-inflammatory properties, and these tend to be plant oils my skin has tried and found okay. But further down the list, there are other ingredients (Citronellol, Citral, Geraniol) are typically found in cosmetics for their fragrance, and can be sensitizing for some skin types. But, most of these appear to be pretty far down the list, so I don't think they are present in large amounts. When it comes to plant oils and extracts, I've found that different people will have different reactions, and I guess the only way to know how these will work out for you is to try them out! The rest of the ingredients include some masking ingredients (Benzyl Salicylate), preservatives (Benzyl Benzoate), emollients (Hydrogenated Polyisobutene), Vitamin C (Tetrahexyldecyl Ascorbate), and Vitamin E (Tocopherol, Tocopheryl Acetate). The Vitamin C and Vitamin E do offer some anti-oxidant properties as well, although they are present in small amounts, but I suppose it's better than nothing. 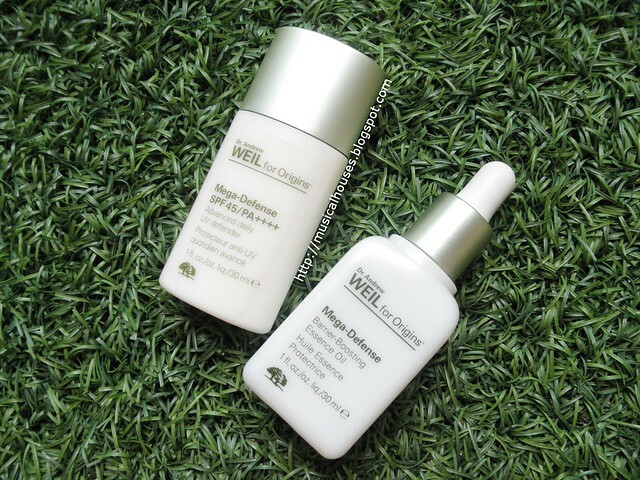 So, looking at the formulation of the Mega Defense Barrier Boosting Essence Oil, we can see that it's a face oil that's been very carefully formulated to be moisturizing but lightweight, through the careful selection of emollients and silicones that are as meant to feel as light as possible. 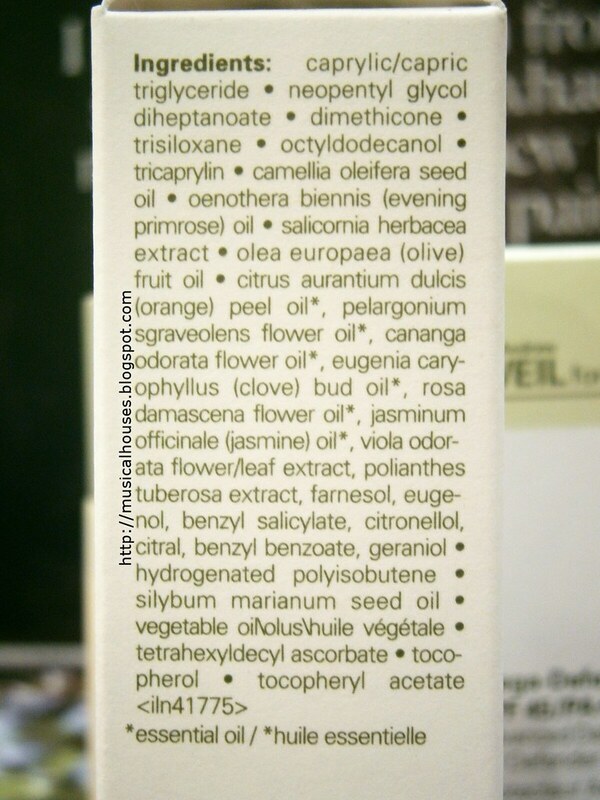 And for those who like plant ingredients and oils, there are many different types of plant oils and extracts in it too. Lastly, a side benefit is from the small amounts of Vitamin C and Vitamin E.
Now that we've looked at the ingredients, what about the product itself? 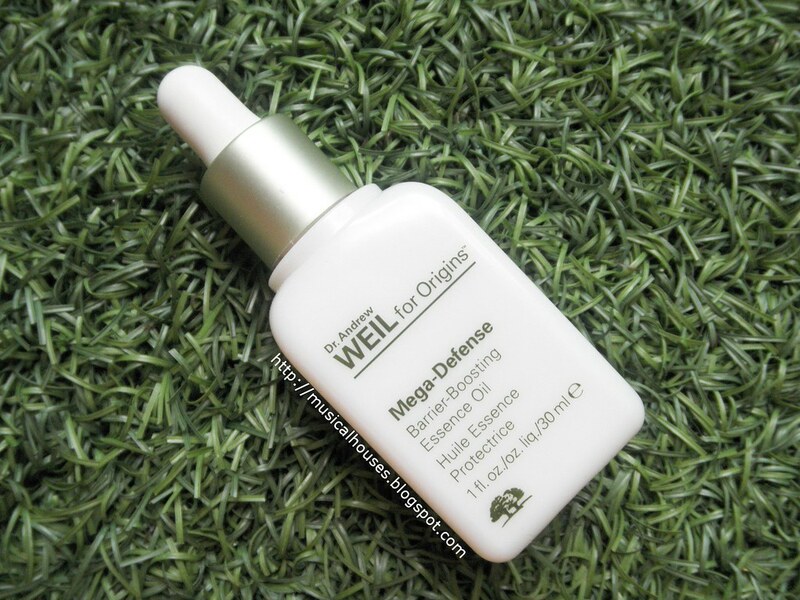 The Origins Mega Defense Oil comes in a handy dropper, and the oil is clear, and has a very light texture, that is thin and flows very easily, and is as watery as you can get an oil to be. Obviously the careful choice of emollients and silicones worked! It does have a very nice citrus scent, thanks to some of the citrus extracts in the products. 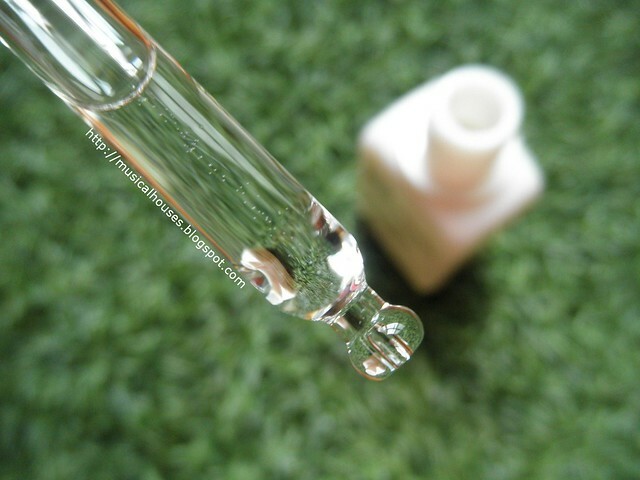 You can see from the photo below that it was a little tricky for me to get a good photo of the Essence Oil, because it was just dripping everywhere! When I used the Essence Oil, I found it to absorb pretty well for an oil, although being an occlusive product it does leave a little bit of a film behind. 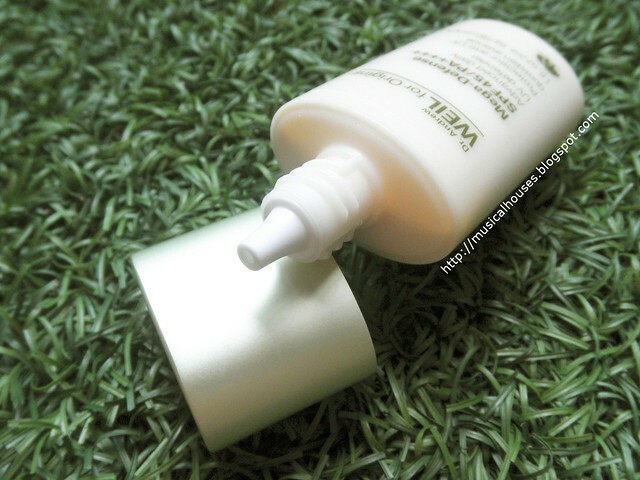 It also does moisturize pretty well, and I personally like using a watery lotion first before applying this. You could, if you wish, layer another moisturizer over this, or just proceed to sunscreen and makeup, depending on your skin type. I would say this is the "face oil for people who don't like face oils", just because it's really very thin and light, so if you're not normally a fan of thick, oily-feeling products but are thinking of making a foray into getting a first face oil, this might just be the product that sets you down that path. 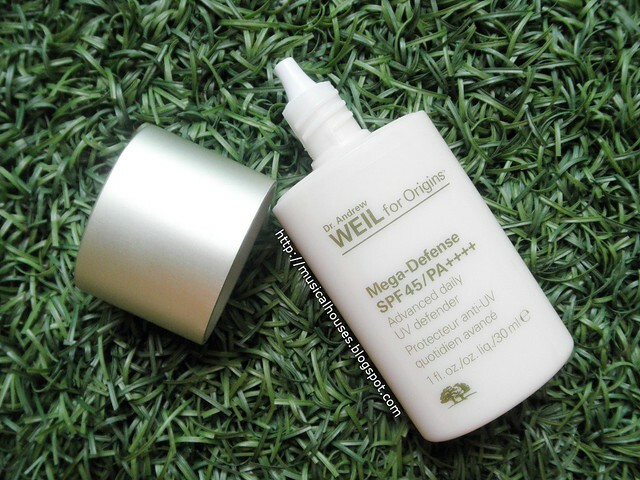 Now that we've looked at the Mega Defense Barrier Boosting Essence Oil, let's now take a look at our next product, the Origins Mega Defense UV Defender SPF45. Origins also claims that this is the brand's "first 100% non-chemical sunscreen". What does that mean? Turns out, the "non-chemical" part most likely refers to the UV filters chosen by the company. The two UV filters are Titanium Dioxide 6.3% and Zinc Oxide 4.0%, both of which are physical filters, which work by physically reflecting the UV rays, as opposed to a chemical filter, which works by absorbing the UV rays. (If you want to know more about the difference between physical and chemical filters, I've got a whole blogpost on sunscreen tips, which includes a neat summary of what physical and chemical filters do.) The nice thing about the physical filters is that they don't degrade over time, so we know the sunscreen is likely to be stable. The sunscreen base includes water, emollients (Dimethicone, C12-15 Alkyl Benozate, Methyl Trimethicone, Isononyl Isononanoate, Diethylhexyl Succinate, Neopentyl Glycol Diheptanoate), which are, again, carefully chosen to give a lightweight feel on skin. Most of these are already quite lightweight in feel, but some of the emollients also help the product feel less oily as a whole (C12-15 Alkyl Benozate), while others function as plasticizers (Diethylhexyl Succinate) which help the product feel more fluid on skin. There's also Butyloctyl Salicylate, which has some emollient properties, but here is probably included as a carrier for the sunscreen agents, Titanium Dioxide and Zinc Oxide. There's also humectants (Butylene Glycol), as well as functional ingredients such as waterproofing agents (Dipentaerythrityl Tri-Polyhydroxystearate) which form a film that helps ensure the sunscreen is more water-resistant, and emulsifiers (Lauryl PEG-9 Polydimethylsiloxyethyl Dimethicone) which help mix the oil and water ingredients together without separating. Then there's also an oil absorber (Silica), and with these ingredients we round out the main ingredients that give the sunscreen its UV protection and main properties. There are also some plant extracts and oils, which judging from their position in the ingredients lists, aren't exactly there in huge amounts. But, there is a large variety of them (Orange Peel Oil, Pelargonium Graveolens Flower Oil, Cananga Odorata Flower Oil, Clove Bud Oil, Rosa Damascena Flower Oil, Jasmine Oil, Viola Odorata Flower/Leaf Extract, Polianthes Tuberosa Extract, Geraniol, Citronellol, Eugenol, Epilobium Angustifolium Flower\Leaf\Stem Extract, Barley Extract, Wheat Germ Extract, Blueberry Fruit Extract, Cranberry Fruit Extract, Wolfberry Fruit Extract, Rosa Roxburghii Fruit Extract, Opuntia Tuna Extract, Scutellaria Baicalensis Root Extract, Yeast Extract), which should really appeal to those who like plant based ingredients. The rest of the ingredients include some categories of necessary ingredients, like preservatives (Benzyl Benzoate, Phenoxyethanol, Caprylyl Glycol), anti-caking agents (Dimethicone Silylate), emulsifiers (Isostearic Acid), and stabilizers (Hydroxyapatite). There are also some silicones and polymers (Cetyl PEG/PPG-10/1 Dimethicone, Trimethylsiloxysilicate , Polyhydroxystearic Acid, Dimethicone/PEG-10/15 Crosspolymer, Hydrolyzed Wheat Protein/PVP Crosspolymer, Dimethicone Crosspolymer-3) with various functions - some are suspending agents (Polyhydroxystearic Acid), some are film-formers (Trimethylsiloxysilicate), adn so on. Lastly, there are also ingredients with some benefit for skin, which include antioxidants (BHT), humectants (Glycerin), emollients (Squalene) and Vitamin E (Tocopheryl Acetate). Interestingly, it's possible that some of these ingredients, particularly those with anti-inflammatory and anti-oxidant effects, could be helping to boost the overall SPF value of the sunscreen, even though there might be there in low amounts. When I tested the levels of Titanium Dioxide (6.3%) and Zinc Oxide (4.0%) into the BASF Sunscreen Simulator (a super useful resource if you know the percentages of each UV filter used, the expected UV protection with these values ranged from ~SPF12 to 15, so just based on the levels of Titanium Dioxide and Zinc Oxide found in the product, you wouldn't typically get a reading of SPF45. However, obviously the final product tested out to be SPF45, so it's possible that some other ingredients could be providing the product with an anti-oxidant or anti-inflammatory effect that boosts the overall SPF reading. It's hard to tell which ingredients are providing this effect, but my guess would be the antioxidants, Vitamin E, and some of the plant oils and extracts. 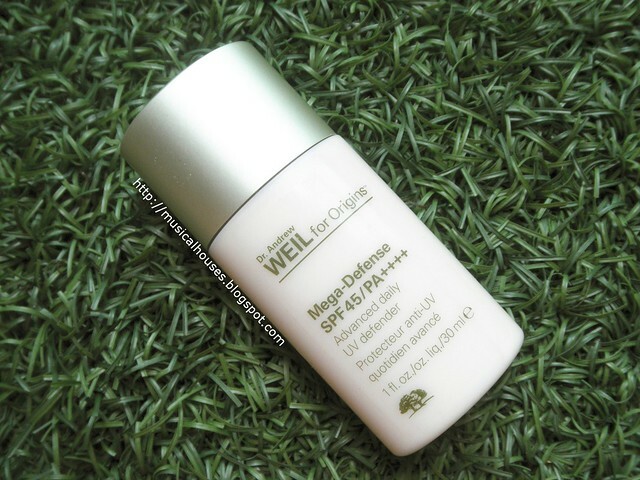 So, looking at the formulation of the Mega Defense UV Defender, we can see that it is a sunscreen that uses physical filters, so this would appeal to people looking for sunscreens with purely physical filers. It is also carefully formulated to be as light as possible, through the careful selection of silicones. And interestingly, Origins has managed to do this without the use of alcohol, which is typically found in sunscreens that are this lightweight, so this would be a great option for those who prefer to avoid alcohol in their sunscreen. Lastly, for those who like plant oils and extracts, there are a bunch of them here, too. Now that we've taken a look at the ingredients in the Mega Defense UV Defender, how does it stack up to actual use on the skin? Turns out, it really does live up to being a lightweight sunscreen - it's very thin in texture, and doesn't feel sticky or tacky when applied to the skin. Also, although it comes out with a white tint, it is colourless when it blends into skin, and doesn't leave behind any sign of a white cast. This would be great for those with oilier skins, or for people with tan skintones and who have trouble finding a sunscreen without a white cast. So, would I recommend these Origins products? I think I would, especially for those who place great emphasis on their products being aesthetically elegant. 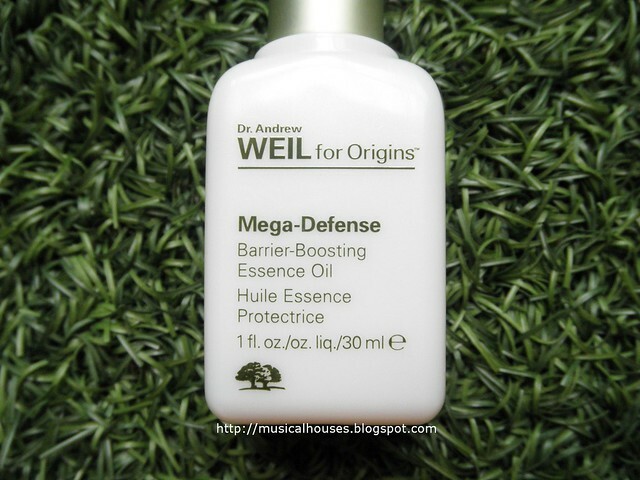 The Mega Defense Barrier Boosting Essence Oil is indeed lightweight, while still being moisturizing, and the UV Defender is also a non-greasy, non-oily sunscreen that absorbs fast without leaving a white cast. Both products also have a variety of plant extracts and oils, which would also appeal to people who like botanical ingredients. Between the two products, my preference is for the Essence Oil, although I suspect in practice I might use the UV Defender more. Perhaps my only gripe with the product is that I wish there were higher concentrations of the UV filters in the UV Defender, because that would aid with increasing sun protection. But otherwise, I think these are worth trying. 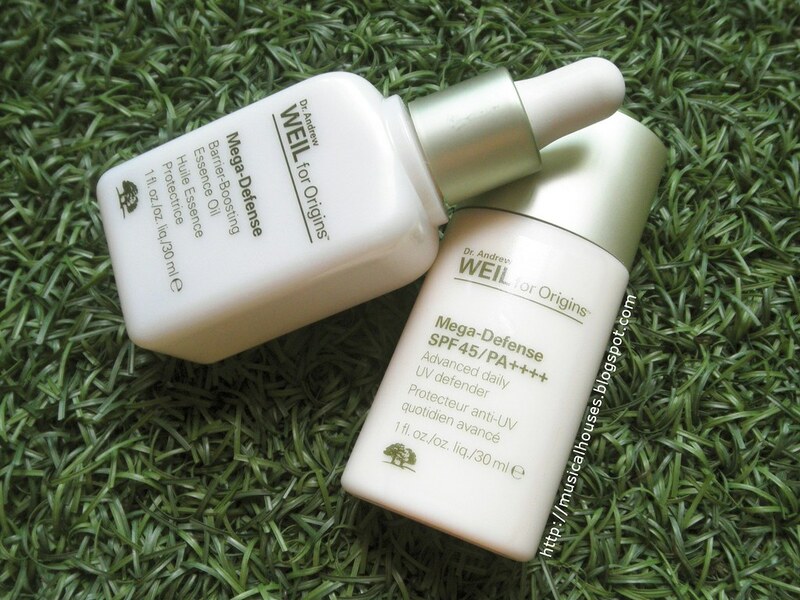 The Bottom Line: Origins Mega Defender Essence Oil and UV Defender are good options for those looking for non-oily, non-sticky products with plant-derived ingredients, and the SPF45 doesn't leave a white cast on skin. Wow! New products to try out. They seem like great ones to try out. I will be checking on those.